AP English Language and Composition: The national average score last year was 2.88. 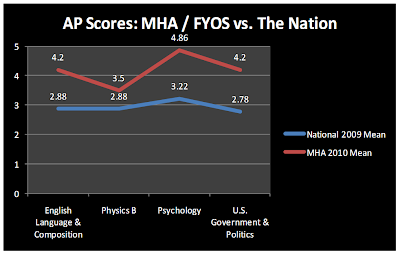 Amongst the 10 MHA / FYOS students who took the test, the average was 4.2 - or 46% higher than the national norm! 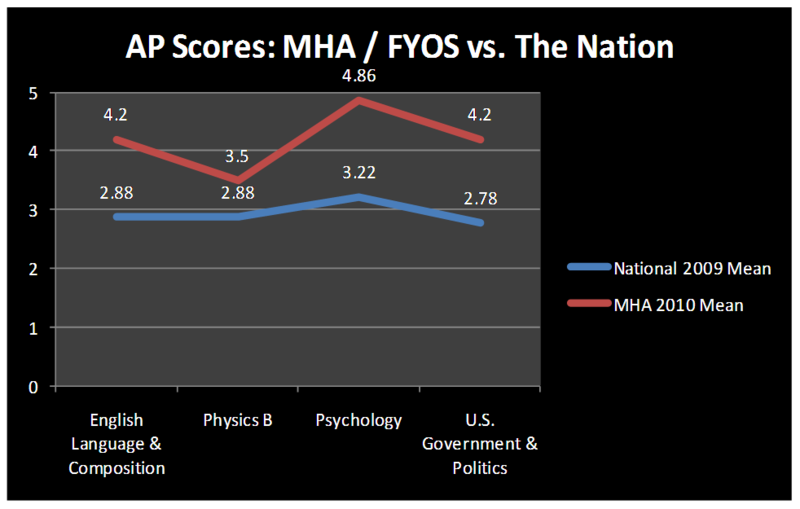 AP Physics B: The national average for Physics was also 2.88. Only 2 students took the test this year, but their average was a 3.5. AP Psychology: Our AP Psychology results bordered on perfection. The national average last year was a 3.22. 14 of our students took the test and all but two received a perfect 5, with the others receiving a very respectable 4. 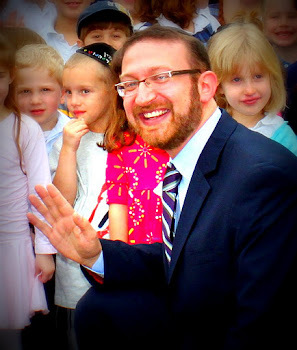 Our school average was a 4.8 - or 51% higher than the national norm! AP US Government and Politics: This was a new offering for our school this year and the results were fantastic. 10 students took the exam and scored an average of 4.2, compared to the national average of 2.78. Here too, our student scores were 51% higher than the average AP student across the nation. Congratulations to Mrs. Johnson, Mr. Vaughn, Mrs. Perl, and Mrs. Kutliroff - and, of course to all of our students - for a job beautifully done!